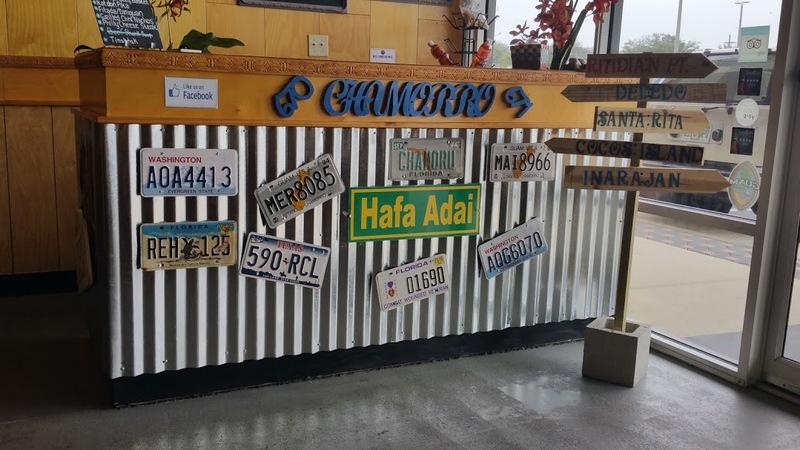 Marianas Grinds, will qualify for the Hole in the Wall category, yet it may have been one of the happiest restaurants I have been in. Bare bones decor, plastic utensils, paper plates and Styrofoam cups. No one seemed to care. The couple who just opened in this spot in November, formerly ran a food stand at the Beach Blvd. flea market just up the street. Now they are bringing their style of Pacific Island food to this little space. And I for one am a very happy woman. 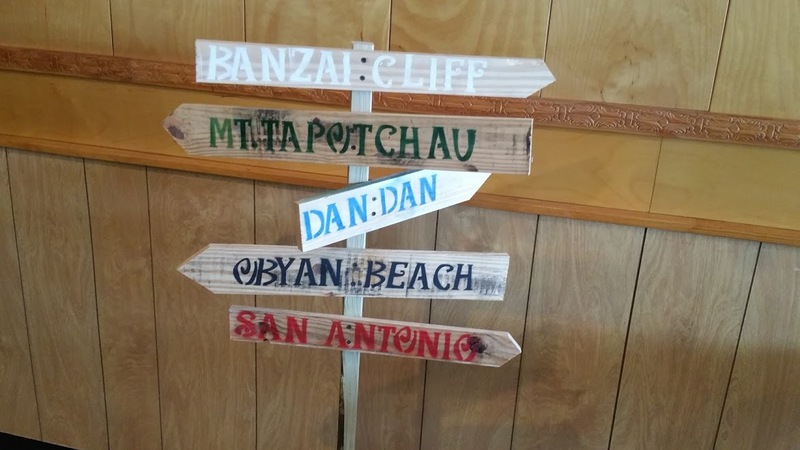 I have spent time in Guam and came to love the food but mostly the people. 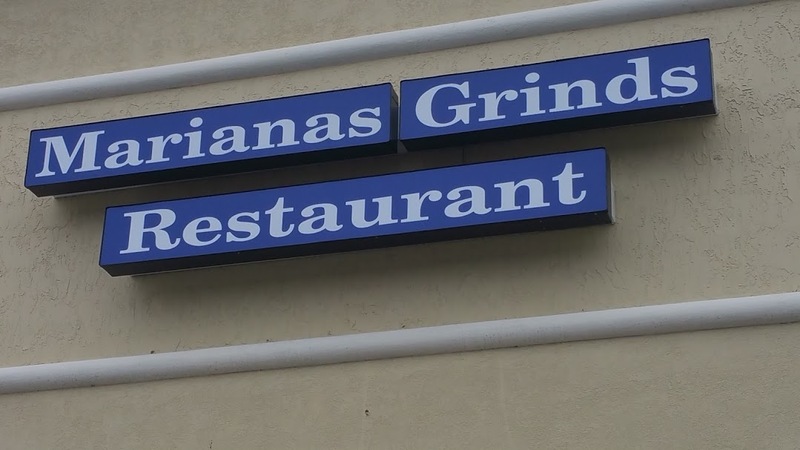 Eating at Marianas Grinds brought back all those memories, of fun times, village fiesta on the weekends at someone’s house and food I never experienced growing up. Lucky for me my food companion was more familiar with some of the foods than I was so he guided me through. There are all the staples, Lumpia, Empanadas, but some I have not seen and that is where I wanted to go. Something I never ate growing up is the notorious Spam, but in Guam it comes in many incarnations and one just has to indulge. Today I indulged again. 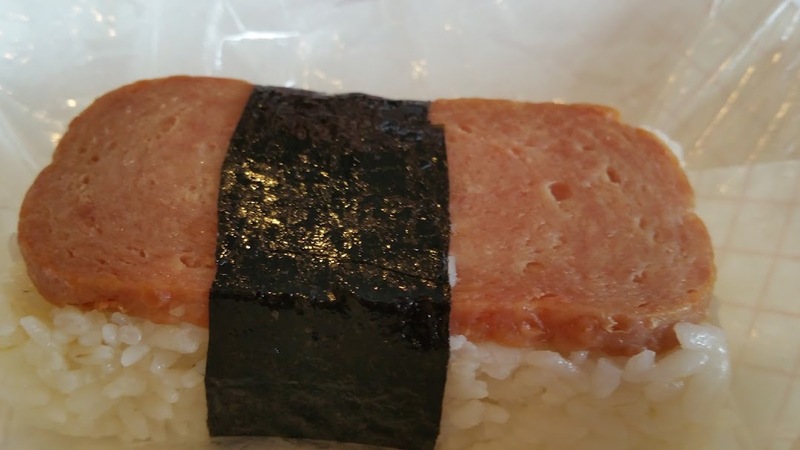 Spam Musubi, a healthy slice of Spam atop a nicely cooked and flavorful rice cake held together with a strip of Nori, with a soy/vinegar based dipping sauce nicely kicked up by the Guam Boonie pepper, guaranteed to explode your head if you don’t know what you are eating. I was in heaven. Both of us ordered this dish. 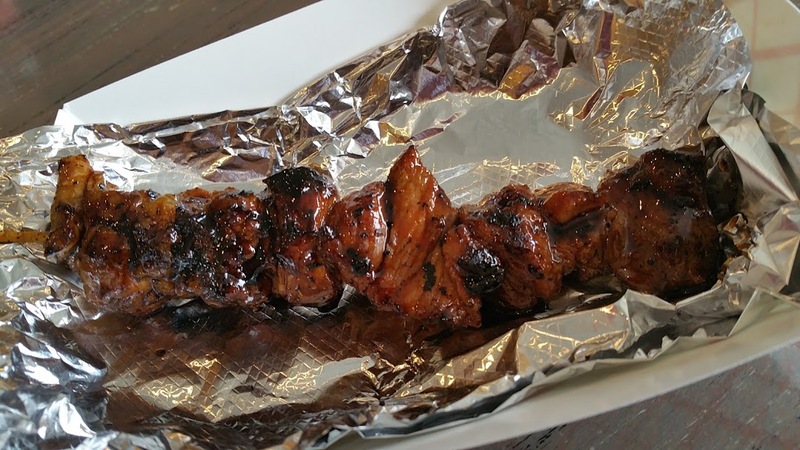 Along with that we had a BBQ Pork Stick and the Chicken Kelaguen wrap. The pork was very tender and sweet with the homemade BBQ sauce. 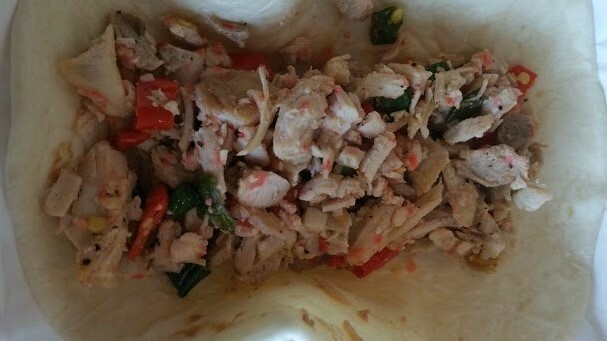 The wrap, soft pieces of torn chicken minced with island spices as well as the famous Boonie pepper in a warm torlilla. I was warned it was going to be hot, but it was all or nothing. I laugh now but I quickly realized I had met my match. It was wonderful!!! For our main dishes, my friend chose the Loco Moco. 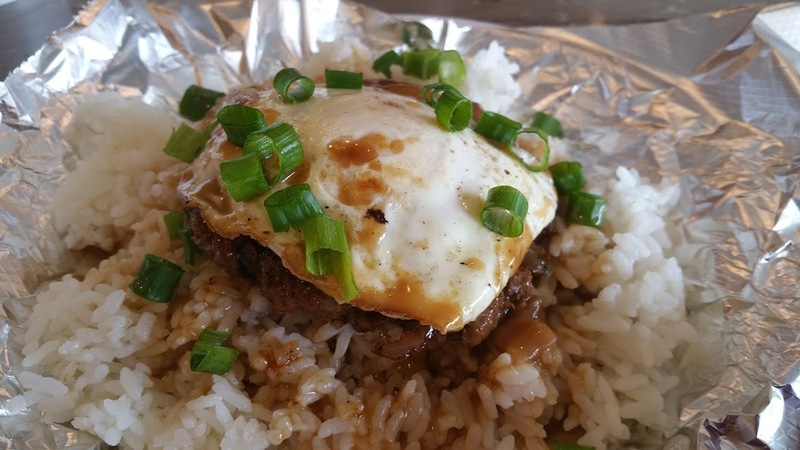 Loco moco is a meal in the contemporary cuisine of Hawaii, traditional loco moco consists of white rice, topped with a hamburger patty, a fried egg, and brown gravy. This delivered, all the goodness one would expect. Meat flavorful, gravy smoothe and tasty and the egg on top cooked to my friends expectation. Ginsian Kanti for me, this was a mixture if high quality flank steak, Asian eggplant, onions and baby bok choy in brown sauce. 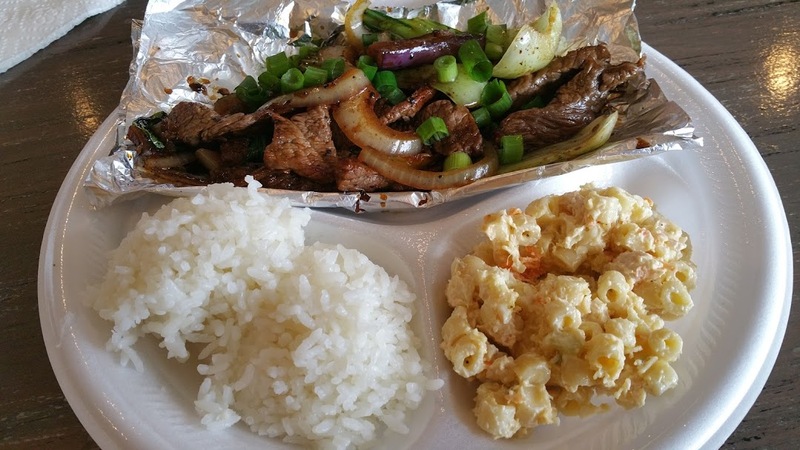 I chose the Mac Salad as my side the rice came with the dish. Flavorful and filling, this dish gets high marks from me. Desserts were available but we were totally sated. Next time. Prices here offer good value for $$ spent. 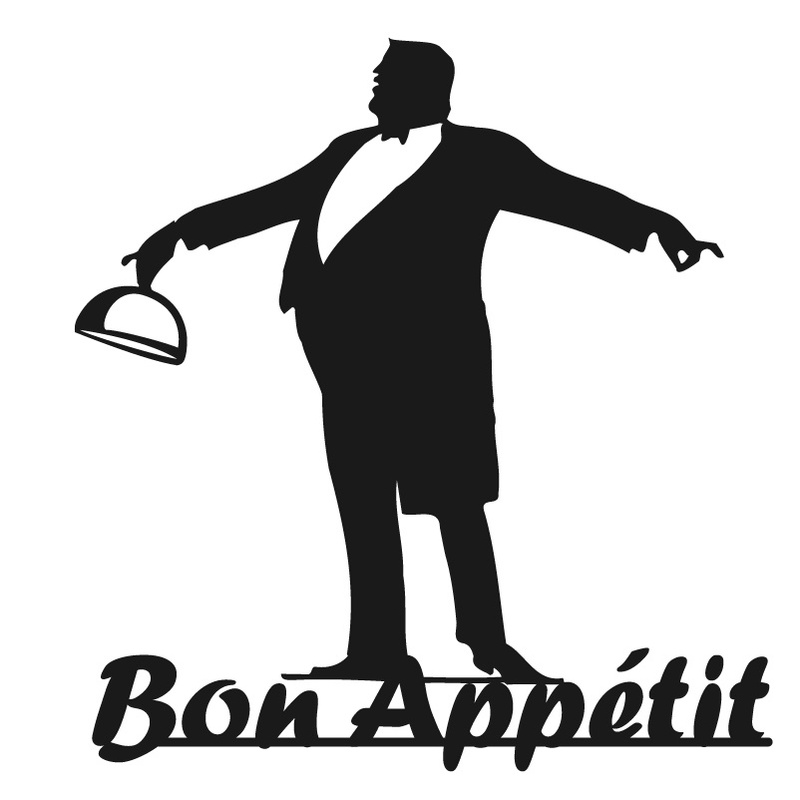 Get out and try something new, indulge yourself in other cultural dishes, it truly is amazing the offerings available when you look. As anyone who reads my blog knows, I am a huge supporter of local, small business that are supporting their families and the community in turn. So it’s only natural that I encourage you to do the same when you are making meal choices. 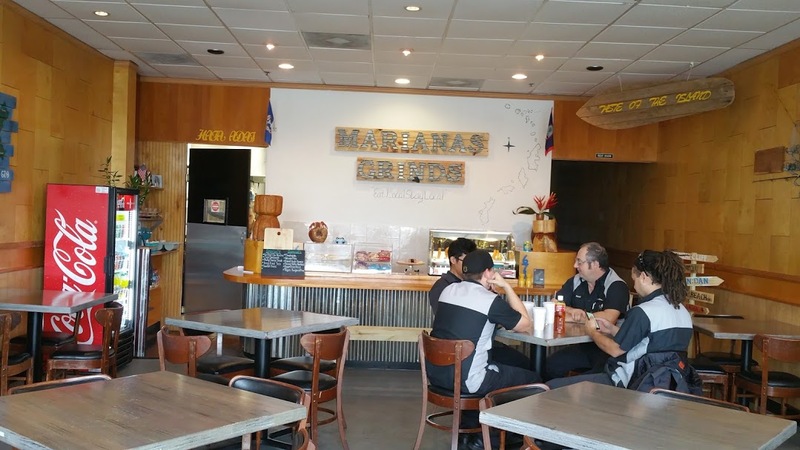 The food here at Marianas Grind is not to be found elsewhere in town, and if you do find it reach out to me.